A new study published last week in the British Journal of Political Science has made headlines of all the major newspapers. 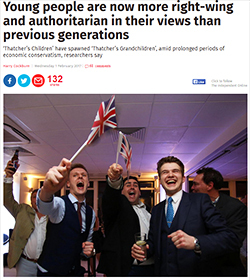 The paper co-authored by SPERI Associate Fellows Stephen Farrall and Maria Grasso, SPERI Co-Director Colin Hay, Will Jennings and Emily Gray, analysed data from the British Social Attitudes Survey taken between 1985 and 2012 and found that Blair’s generation is even more rightwing that Thatcher’s children. The study shows that opinion have moved sharply to the right since 1979 and not switched back with young people showing a strong preference for right-wing policies in regard to the welfare, crime and the economy. While Thatcher is responsible for embedding conservative authoritarian values, the authors argue that New Labour governments ‘reproduced, not challenged’ the political philosophy of previous Conservative governments which allowed it to be passed on to a new generation. Colin Hay welcomed the exceptionally wide coverage of the paper’s findings and noted that it is the first research of its kind to show empirically the powerful long-term effects of Thatcherite ideas on the political thinking of British citizens. “What is particularly striking”, he added, “is the overwhelming evidence it presents of the role of the Blair governments in consolidating economic liberalism in Britain”. Stephen Farrall, speaking to The Independent, said: “Blair did not really challenge the kind of discourse which Thatcher had set up. Remember Peter Mandelson’s quote about being ‘quite relaxed about people getting rich’”. “Our take is that the younger generations have become increasingly socially and economically liberal. The study can be accessed here: Thatcher’s Children, Blair’s Babies, Political Socialization and Trickle-down Value Change: An Age, Period and Cohort Analysis.